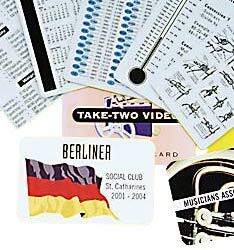 Looking for a different type of business card? Something that stands out and makes your clients say, "WOW"! Plastic business cards offer just that. There are many uses for plastic cards: Business cards, client id, promotions, calendar cards, memberships, identification, point of sale discounts, VIN ID cards, dealer loyalty, discounts, warranty cards, bar and nightclub VIP cards, preferred door entry cards, frequency cards, computers warranty cards, customer support cards, internet access numbers, discount cards, frequent customer cards, bag tags, key cards, employee ID badges, library ID cards, bar codes, telephone cards, promotional cards, security access control, reminder cards, and many other uses.